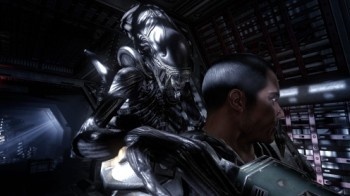 Sega and Rebellion Studios have issued a statement apologizing for the matchmaking issues in the new Aliens vs. Predator multiplayer demo and, more importantly, a patch that corrects the problem. Rolled out yesterday, the demo for Rebellion's new Aliens vs. Predator was sweet relief for many long-suffering fans of the AvP franchise, who haven't had a proper new game to sink their teeth into since Aliens vs. Predator 2 from all the way back in 2001. For others, however, it was an exercise in frustration as the PC and PlayStation 3 versions ran into trouble finding and connecting to games. "Unprecedented demand for Aliens vs. Predator following the release of the cross-platform demo yesterday morning brought to light matchmaking issues on the PC platform resulting in players having to wait to join games, or even not find games at all," Rebellion said in a statement. "We're pleased to say later in the day the issue was corrected and a small patch to the PC executable next time you launch it from Steam will have you finding and playing games using Quick Match as it was intended," the statement continued. "While this issue did not affect the Xbox 360, we are, with Sega's assistance investigating reports of a similar nature on the PlayStation 3 and working flat out on a solution." In order to keep things simple, the demo was limited to matchmaking and setting up friend lists, but Rebellion noted that the full version of the game will include the ability to create and browse through online games. "We're really sorry that this issue tainted a day in which we saw many people get hands on with AvP for the first time," the studio said, "and we're hugely gratified by the positive feedback to the game." Aliens vs. Predator is scheduled for release later this month on the PC, PlayStation 3 and Xbox 360.